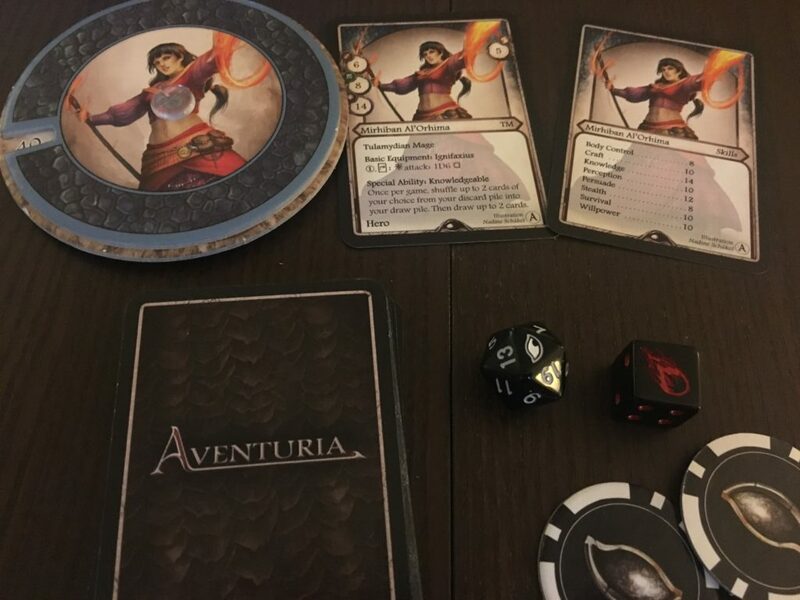 If I am to offer any advice to new Aventuria players who want to try the solo adventures, it is to choose your hero carefully. Layariel is an excellent choice because she has so much flexibility, and Carolan is solid because his high Dodge makes him very survivable right out of the gate. Both of those decks have a good mix of healing, armor, and multi-attack strategies that work well for solo play. Arbosh and Mirhiban are much more focused, which makes them harder to solo. Their low dodge makes them tricky to keep alive early in the game, especially when they are taking every attack. Arbosh in particular takes a long time to set up. Plus he has zero healing, relying exclusively on armor to keep himself alive. Mirhiban is a glass cannon with many high-powered damaging spells but little protection. She has a bit of healing and damage reduction, but overall she is very fragile. 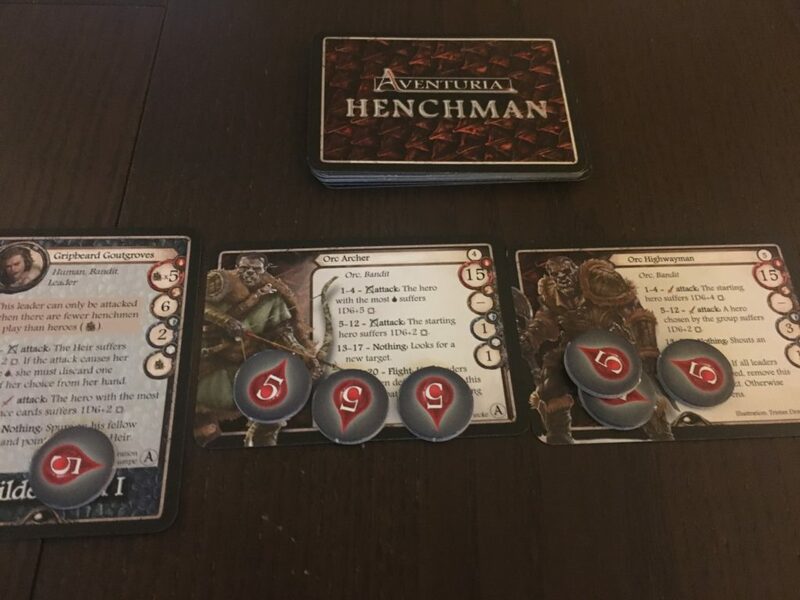 The Henchman draw could not have gone worse. Since the Orc Archer has a threat value of 4, that means that I must draw another card even though the target threat is 5 (heroes times 5). And then I drew an Orc Highwayman, who is ridiculously difficult to kill early on because of that 3 armor. 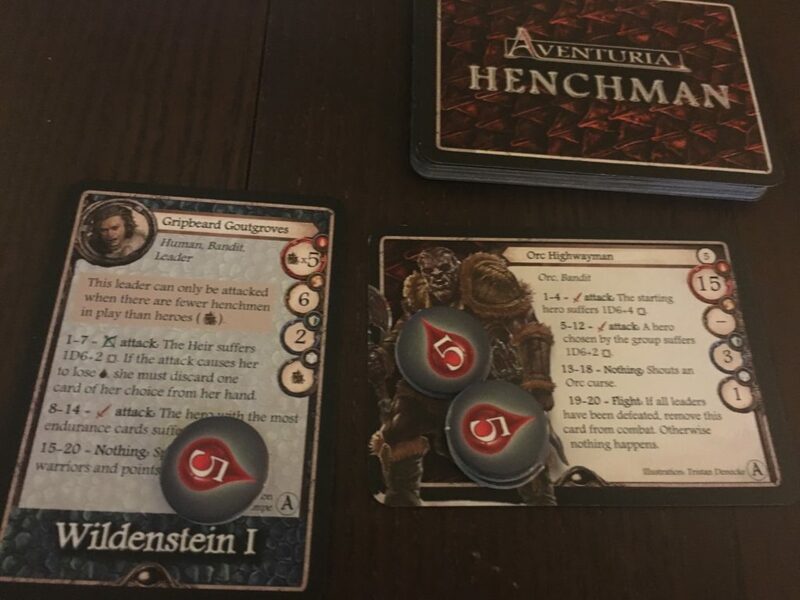 So I’m staring at 9 threat of Henchmen on turn 1 – this is not going to go well. Being the Heir (one of the features of “Legacy of Wildenstein”) helps a bit, because you end up drawing 4 cards at the beginning of each turn instead of 2. By the third round, I had a Helmet, Chainmail Leggings, and 2 attacks, but the multiple big attacks were crushing me. I had 6 Life Points going into the fourth round, and I hadn’t managed to get out any of my big weapons, since I was struggling just to stay alive. That ended up being my last round, and it turned out Arbosh was in no position to claim his inheritance. That Highwayman again, but at least this time he’s alone! And Mirhiban has multiple strategies for dealing with high-armor targets, at least one of which (Call Djinn) is a permanent. I knew that my extra draws would likely get those out sooner, so I was feeling good. That said, this was still a rough combat. 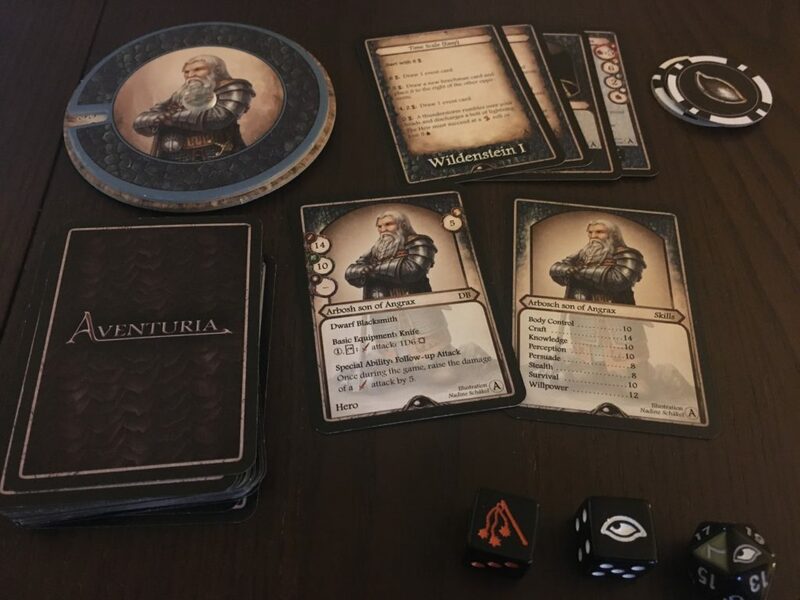 I managed to get a Disintegratus on Gripbeard on the first turn (using an Arcane Meditation for the extra Endurance), and that helped significantly. It prevented 10 total damage over the 7 round game. Still, Gripbeard kept rolling those 1-7s, which meant that I had to choose between a multi-attack strategy and going hard into the magic. I decided to go hard into the magic, dropping my early short bow in favor of the classic Call Djinn/Fulminictus Thunderbolt combination. I managed to get out a 5-cost Balsam (for 10 healing) and an Armatrutz to help me stay alive just long enough to finish everything off and have 2 Time Counters left. I chose to use both of those counters for healing so that Mirhiban will head into the next act with full health. 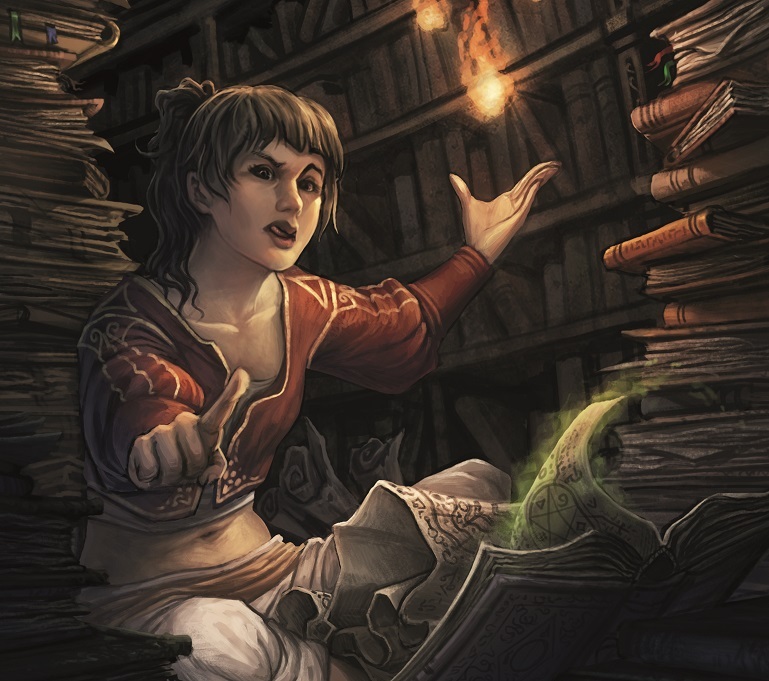 Her 1 XP went towards upgrading her Perception to 11, since she drew a close combat reward card. Stay tuned to find out if Mirhiban can make it all the way through this adventure and become the true Heir of Wildenstein!